December 2, 2015 -- CHICAGO - New technologies being highlighted by Philips Healthcare at RSNA 2015 include its novel Lumify app-based ultrasound model, as well as a CT scanner designed to make spectral scanning more routine. Lumify is designed to make ultrasound scanning available to new clinical segments through a subscription-based service. It consists of a transducer that connects to Android-based smart devices such as phones or tablets via a micro USB cable, and scanning packages that are available by subscription via an app store. The transducer has all of the electronics needed for scanning built into its handle and costs $199 a month, while additional scanning apps are extra. The Lumify transducer can plug into any Android-based smart device. In its RSNA booth, Philips is demonstrating Lumify with the first available app, which performs basic scanning such as grayscale and color Doppler. Other apps are being developed for specialized scanning. Lumify began shipping in November. In more traditional ultrasound, Philips is discussing the upcoming Evolution 2.0 upgrade for its Epiq scanner. The package includes features designed to improve workflow and efficiency and also address concerns about data security. Workflow enhancements include features such as reducing by 50% the number of pages required for reporting, along with automated exam processing. Philips is also noting that the company has shipped twice as many Affiniti scanners as expected since commercialization of the unit began in mid-2015. Finally, OmniSphere is a new ecosystem of tools, applications, and services that are designed to help users of Philips ultrasound technology improve their operations and increase their efficiency. 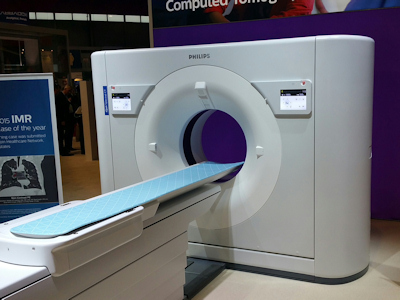 After introducing the IQon spectral CT scanner at RSNA 2014, Philips is preparing to begin commercial shipments of the system in 2016. The company is highlighting the unique, "always on" spectral capabilities of the system, meaning that users don't have to decide before a scan begins whether to turn the spectral mode on -- they can reconstruct scans in either spectral or conventional modes. 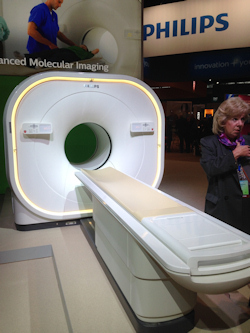 Philips' IQon spectral CT scanner is expected to begin shipping in 2016. Philips is also promoting a clinical study from Case Western Reserve University that found that using spectral CT frequently changed patient diagnosis. DoseWise Portal 2.0 is the latest version of the company's radiation dose management package that enables users to get a better handle on dose across their enterprise. New features include an enhanced dashboard for viewing patient data and a peak skin dose reporting feature for fluoroscopy procedures. DoseWise Portal 2.0 lets healthcare providers know when high radiation dose levels are reached that require follow up. DoseWise Portal 2.0 can also be integrated with Philips' DoseAware Xtend to allow facilities to monitor radiation dose to staff. SkyFlow is a new digital x-ray technology for the company's MobilDiagnost and DigitalDiagnost systems with wireless detectors that enables digital radiography (DR) exams to be performed without a grid by reducing the effect of scattered radiation that can occur with gridless exams. Conducting DR exams without a grid is attractive to technologists because the DR panel is lighter and can be positioned more easily, but radiologists may not be happy with the resulting images due to scatter radiation. SkyFlow allows facilities to achieve the workflow benefits of gridless imaging while correcting for x-ray scatter and retaining image quality. SkyFlow was first launched in 2014 for chest imaging and is now available for all applications. The technology is pending U.S. Food and Drug Administration (FDA) clearance. Veradius Unity is a surgical C-arm with the third generation of the company's flat-panel digital detector. New enhancements include color-coded locks on the C-arm, an updated user interface, preset scanning parameters, a drawing tool to make notes on the system's monitor, and an algorithm for metal artifact correction. Vereos is a PET/CT scanner based on digital technology. In molecular imaging, Philips is shining a spotlight on its new Vereos digital PET/CT system. Vereos digital PET/CT replaces current photomultiplier, detector-based technology with solid-state instrumentation. It also features the company's proprietary digital photon counting technology designed to reduce the tradeoff between sensitivity and resolution. Dr. Michael Knopp, PhD, vice chair of research at Ohio State University's Wexner Medical Center, presented a study at RSNA 2015 in which Vereos PET/CT's solid-state, digital technology was compared with photomultiplier, detector-based, time-of-flight PET/CT. The phase I trial evaluated 25 clinical care patients. The digital PET/CT system showed greater count sensitivity and enhanced spatial and contrast resolution for better lesion detection and improved quantification, especially with small, metabolic active lesions, the researchers found. Philips is showing new enhancements in interventional x-ray and image-guided surgery for its AlluraClarity angiography system. The company has developed interventional suites tailored to specific clinical applications, including NeuroSuite, OncoSuite, and Hybrid Suite. New technologies in the suites include EmboGuide and VesselNavigator. EmboGuide lets users perform automated detection and segmentation of feeder vessels providing blood supply to lesions, and could be useful for transcatheter chemoembolization (TACE) procedures. VesselNavigator supports navigation through complex structures by providing 3D visualization. The company is also demonstrating its progress in integrating technology from Volcano into its interventional product line. Philips acquired the developer of intravascular ultrasound and fractional flow reserve technology earlier in the year. As part of its data sharing, analytics, and visualization platform, Philips is touting its IntelliSpace Portal 8.0, designed to help radiologists detect and diagnose disease and follow up patients. IntelliSpace Portal 8.0 features new applications, such as 3D quantitative renderings of tumors, and offers more than 68 clinical applications for seven modalities, including CT, MRI, ultrasound, mammography, and interventional x-ray. Philips is highlighting its new in-bore experience designed to help patients overcome anxiety about undergoing an MRI scan and claustrophobia, improving the patient experience and the number of successful exams. Patients wear a type of visor over their eyes with a mirror so they can see the reflection of a tranquil scene, such as the ocean, projected from the wall behind them. There is also a headset with AutoVoice to talk the patient through breathing exercises to help them stay calm. The company also unveiled its MRI user interface guide to help with the imaging of patients with MR-conditional implants, such as knee and hip replacements, spine implants, and pacemakers. The new ScanWise Implant software is pending 510(k) clearance from the FDA. It allows the operator to enter the condition values specified by the implant manufacturer and to automatically adjust all scan parameters for the whole examination to stay within the limits of the MR implant conditions. 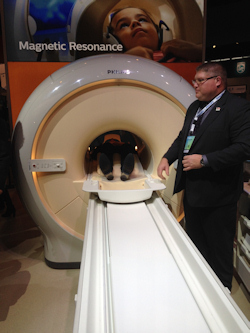 Philips also touted its new modified Dixon (mDixon) technique for 3D water-fat MRI. mDixon's unrestricted echo time allows for four images in one breath-hold -- water and fat images, plus phase-in and opposed-phase images. 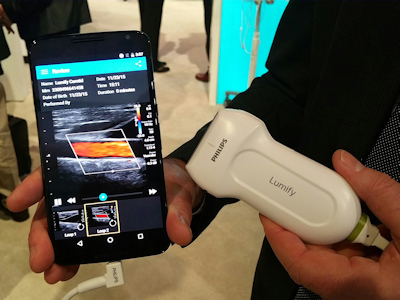 Philips launches Lumify smart ultrasound in U.S.
Philips Healthcare has introduced its Lumify smart device ultrasound program in the U.S.
Axsun Technologies has divested from Volcano, a subsidiary of Royal Philips, the parent company of Philips Healthcare.